KABUL, Afghanistan — Afghanistan's protracted war killed a record number of civilians during the first six months of this year, according to a U.N. report released Monday, which blamed the majority of the deaths on bombings by insurgents. U.N. High Commissioner for Human Rights Zeid Ra'ad Al Hussein said the "horrifying" figure of 1,662 people killed between January and June of this year "can never fully convey the sheer human suffering of the people of Afghanistan." "Each one of these casualty figures reflects a broken family, unimaginable trauma and suffering and the brutal violation of people's human rights," he added. 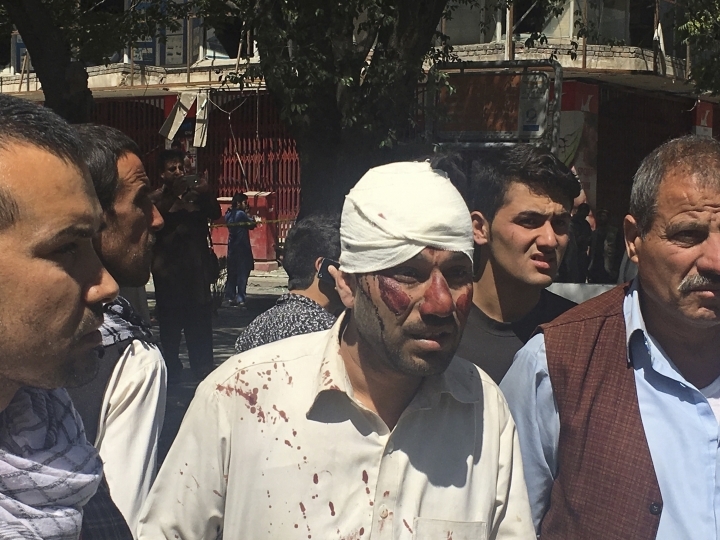 The report confirmed that a massive truck bomb in the center of Kabul on May 31, which killed at least 90 people, was the deadliest attack since the U.S.-led invasion that toppled the Taliban in 2001. It also noted that more women and children were among the dead this year. Insurgent attacks killed 1,141 civilians, a 12 per cent increase over the same period last year, according to the report, which said such attacks wounded another 2,348 people. The report commended Afghanistan's security forces, saying fewer civilians were caught in the crossfire compared to last year. It said 434 civilians were killed during military operations against insurgents. Gen. Dowlat Waziri, a Defense Ministry spokesman, blamed the high toll on the insurgents' use of human shields. "The army is being very careful during operations to prevent civilian deaths," Waziri told The Associated Press. Taliban spokesman Zabihullah Mujahid rejected the "biased" report, saying it did not take into account civilians killed by Afghan and coalition forces in areas controlled by the Taliban. He did not provide any figures and there was no way to verify his claims. The insurgents have expanded their footprint in Afghanistan since U.S. and NATO forces formally concluded their combat mission at the end of 2014, and the Taliban now control a number of districts across the country. The Afghan government said Monday that troops retook a key district in the southern Helmand province from the Taliban. The fighting in the Naway district was fierce, with more than 50 Taliban killed, according to Waziri, who said just five security forces were wounded. There was no immediate comment from the Taliban. Naway is located just 16 kilometers (10 miles) from Lashkar Gah, and had been a staging area for militant attacks on the provincial capital. U.S. and NATO forces are assisting Afghan troops in Helmand. Elsewhere in Afghanistan, the Taliban snatched three border police officers from their car in the western Herat province, including a woman, and killed them, said Jelani Farhad, the provincial governor's spokesman.